Our explosion-proof helical gearmotors are also always a safe option for you. 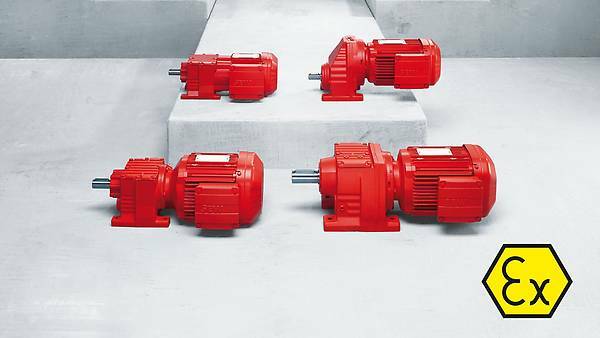 Choose the right combination for your plant from 10 motors and 21 helical gear unit sizes – ATEX compliant as always! R..EDR..helical gearmotors fully comply with the ATEX standard. In II2GD and II3GD versions, they offer the ideal combination of performance and explosion protection. Particularly when selecting motors, you should not have to make compromises. Our ATEX-certified EDR.. motors are critical components when it comes to drive safety in potentially explosive areas. A number of motor sizes cover a power range from 0.12 kW to 45 kW and offer a large degree of flexibility in terms of selection. Plant-specific torques ranging from 50 Nm to 18,000 Nm can.be flexibly realized in combination with the robust, explosion-proof helical gear units from the R series. This broad spectrum is made possible by the SEW-EURODRIVE modular concept. Our explosion-proof R..EDR..helical gearmotors are available for categories 2 and 3. 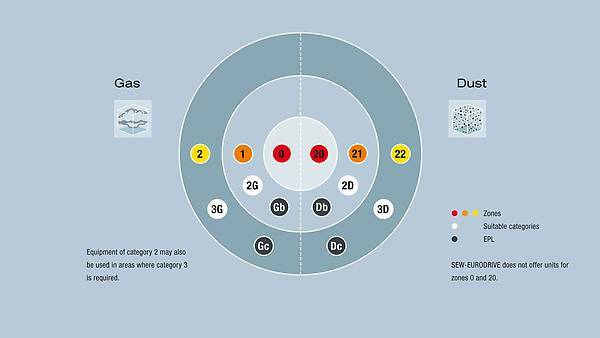 They can also be safely used in gas zones 1 and 2 and/or in dust zones 21 and 22. Our explosion-proof R..EDR.. helical gearmotors also always meet high demands in terms of low weight and space-saving installation. The proven motors/gear unit combinations in ATEX design offer maximum explosion protection. The modular concept for EDR.. motors and ATEX helical gear units is particularly extensive. R..EDR.. helical gearmotors offer powerful performance, even when high torque values are required. In accordance with the IECEx Certified Equipment Scheme, EDRS and EDRE motor types are audited and certified by PTB by means of ExTr, QAR, and CoC. For more information on the certification system, see the website of the International Electrotechnical Commission.